While the average screen has about 4,000x2000p quality, a Crestron 4K display has four times the amount, totaling over 8.3 million tiny pixels that capture an unprecedented high-res picture. A 4K screen is the perfect choice to enhance Game Night so you’ll never miss a suspicious foul or tricky pass. Whether there are several screens installed throughout your restaurant or bar, or just a single one for your home, you’ll feel like you’re sitting at the front lines with the sharp clarity and color. And with a 4K screen, your business or residence will soon become the favorite spot to hang out and watch the big game. Unfortunately, football only stops for the clock, not your bathroom breaks or drink refills. Don’t miss a moment of the big game even if you need to restock the chips and guac or answer the front door. With distributed audio systems, stream the audio of the game to whichever spaces you like, from the bathroom to the kitchen, so you don’t have to miss a moment. You can even adjust the volume of each individual room through an app in your smartphone so you always remain in control of your surroundings even if your guests go wild after a loss. When there’s a crowd of excited football fans around food and drink, spills are bound to happen. Make a quick and efficient cleanup with a central vacuum system. The vacuum hosing is installed in a nearby wall so you can pick up messes before they leave stains or smells. Most homes can be retrofitted for a central vacuum, and often cost less than a high-end portable vacuum, which can be heavy to maneuver and tricky to operate. However, a central vacuum is straightforward to use and efficiently within reach, so you can deal with spills fast then get back to the game. 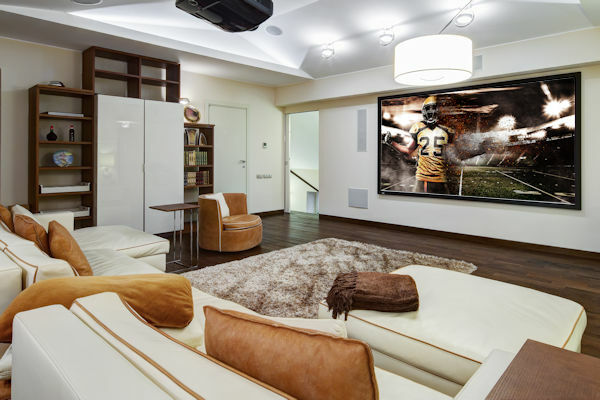 Consider integrating all these automated aspects into your home or business before football season ends to make the most out of upcoming games. And hey, all these features will work great when March Madness, the Olympics, and the World Cup roll around too. Moving into a New Home? Start These Projects Now! Data Power your lighting!!! Its here! Smart mirrors, a worthwhile investment? 7 ways a smart home can improve your home value.